DocTools HideSpellingSuggestions is an add-in for Microsoft Word. The add-in works with Word 2007, Word 2010, Word 2013 on PC. Note that the add-in previously worked with Word 2016 too. However, due to changes in Word 2016 (at least in Click-to-Run versions), it may now result in an error when initiating spell check. If you install the add-in in Word 2016 and experience such error, you should uninstall the add-in again. The add-in hides the spelling suggestions from the right-click menu that appears when the selection is in text marked as a spelling error. 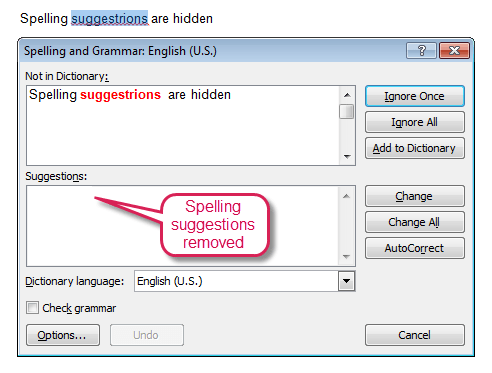 In addition, spelling suggestions are removed from the Spelling and Grammar dialog box. See the illustrations below. The illustrations are made in Word 2010. The right-click menu in Word 2013 contains fewer commands. The idea is to train Word users to think more about what they write and maybe consult e.g. a dictionary instead of randomly selecting a spelling suggestion provided by Word. Spelling suggestions are found in two places in the Spelling right-click menu. Spelling suggestions removed from right-click menu. You will find more details about the add-in below. An email with a download link will be sent to the email address you specify. appear within a few minutes. Click the link in the email to download a zip file that includes the add-in. Installation instructions are included in the email you receive. I developed this add-in based on a question from a Word user, Gary Ward, back in the start of 2014. Gary asked in a Word forum whether it is possible to hide the spelling suggestions in Word but still have spelling mistakes marked. Gary wanted to teach his children to use a dictionary in relation to their Word based homework instead of blindly relying on Word's suggestions.There is no way to obtain this using Word's built-in functionality. 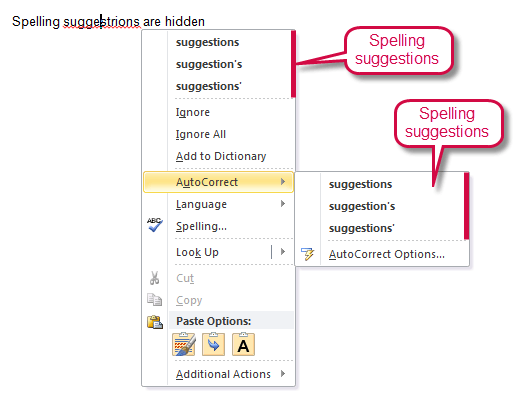 Therefore, I made some experiments to find out how the spelling suggestions could be hidden without disturbing or changing the way all other spelling and grammar functionality works in Word. The end result was the DocTools HideSpellingSuggestions add-in. As explained and illustrated in the Introduction section above, the add-in hides spelling suggestions from the right-click menu that appears when the selection is in text marked as a spelling error. 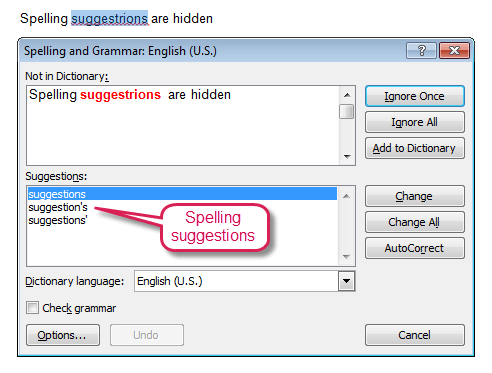 In addition, spelling suggestions are removed from the Spelling and Grammar dialog box. Initially there were a good few grumps and moans as the girls would repeatedly right click and then realize that no suggestions were offered. I had hoped that they would start using a dictionary; retro I know, using paper, but I’m still a firm believer in the value of books. They haven’t moved to a paper dictionary but being of the digital age they have moved to online dictionaries or Google. I would still call the exercise a success because, regardless of source, they still have to go away and find the correct spelling and copy it to their work. In looking through their work there are very few spelling mistakes so they are being conscientious enough to look it up, and they must also be reading the explanations as it’s rare to find the wrong spelling option. I think this is valuable where parents or teachers want to ensure the children are not reliant on Word suggestions and are thinking about what they write. DocTools HideSpellingSuggestions adds an icon to the Quick Access Toolbar (QAT). The icon lets you open a dialog box with information about the add-in. In addition, the dialog box includes a link to this website for easy access to further information and other add-ins. When you install the add-in, this icon is added to the QAT. You can initiate spell check by pressing F7 or by selecting Review tab > Spelling & Grammar. 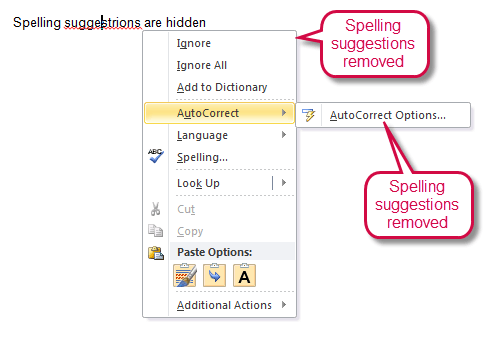 In Word 2007 and 2010 this opens the Spelling and Grammar dialog box. This has, however, been changed in Word 2013 - instead of a dialog box, a task pane is opened - by default positioned to the right in the window. Note that if you install the DocTools HideSpellingSuggestions add-in, F7 and Review tab > Spelling & Grammar will open the Spelling and Grammar dialog box as in earlier versions of Word.